Rakem launches its Android PrivateMic application for secure, encrypted and private calling services. The updated Android app provides Rakem’s unique PrivateMic feature. With PrivateMic, Rakem prevents other apps on the Android device from accessing the microphone while in a call. Even if a user has unknowingly downloaded an app that listens to the microphone, which could be recording conversations while the user is unaware, PrivateMic stops these apps from listening while in a Rakem call – your conversation cannot be listened to or recorded by unwanted and unauthorized apps. Rakem PrivateMic works on any Android device – no need to purchase a proprietary phone like Blackphone for making calls. Rakem uses true end-to-end encryption - you can rest assured that only you and the intended recipient can listen to your conversations. Today, Rakem announces the availability of the Android PrivateMic version. Rakem is also available on iOS, Windows and Mac. Rakem runs over any internet connection. Anyone with data services on Android, iOS, Windows or Mac OS can download and start using Rakem immediately. 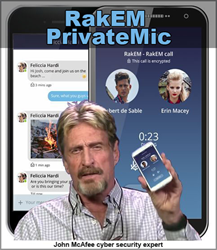 Rakem Android with PrivateMic is available for download from Google Play Store. Raketu Communications Inc. makes highly secure, cross platform messaging and communication fun by developing leading edge device-to-device direct Internet protocol applications for consumers and for business across mobile devices, tablets, desktops and laptops. Powered by Raketu’s patent-pending Serverless Secure™ encryption technology and system architecture, Raketu’s RakEM mobile messaging platform supports text, voice, video, and photo, among other private and encrypted messaging media. The company currently has users in over 150 countries around the world. For more information visit the company’s website at http://www.Raketu.com.